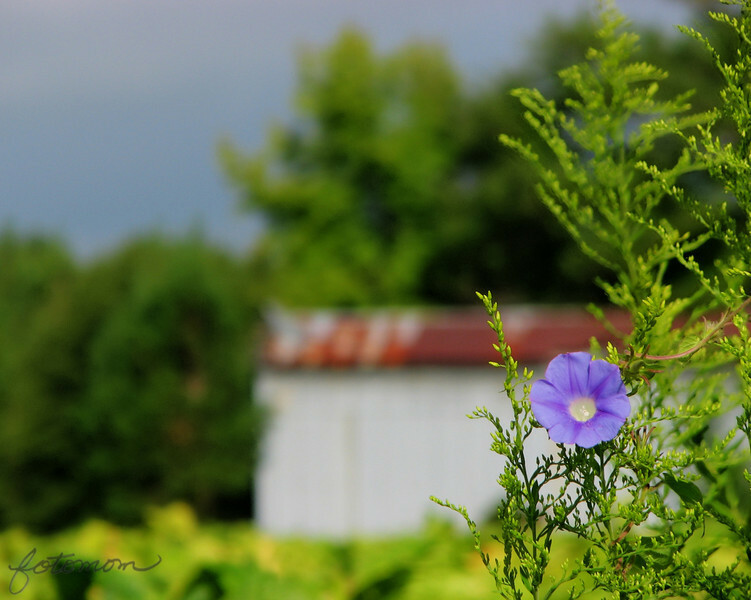 On the way home from dropping the kids off at school this morning, I stopped to take some pictures of the morning glories beside a tobacco field. I'm kindof bored taking flower pictures (hit me in January when I am dying to take flower pictures) wishing I had more opportunities for people shots or at least barn settings. I've been looking at this barn for years...daily. It's not much. I saw this one sole morning glory up high enough where I could get it and the barn in the shot and though I'd try to take some bracketed images for HDR and see what I could do with them. I've seen so many wonderful settings on SmugMug by other photogs where they compose some foreground object in front of a gorgeous background scene. I knew this would not be quite that but wanted to try anyway. So, tonemapped, straightened, cropped, and a stray piece of grass removed, here you go. With TD Lee past us, the sky was fantastic! Very nice, I like the composition. Very pretty Maryann. Nice focus on the morning glory and the barn in the background is great. Nice light, color and composition! This is absolutely fabulous!!! LOVE it! Wonderful comp with the morning glory anchoring the corner & the 'tobacco row' in the background. Thanks for your b-day wishes & kind words of encouragement. Lovely capture! Yes...the magpie was in my yard at our house in Colorado...there was about 8 of them fighting over the suet feeder! I need to get more feeders up,cause it doesn't take them long to wipe out a feeder!! I love the focus on the morning glory. This is super Maryann!! !